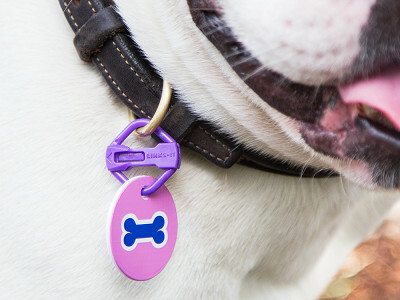 Pawdentify’s pet tag connector, Links-It® with Kevlar®, is a great upgrade from traditional metal rings and hooks. It lets you easily change tags and move them from collar to collar. Swap out pet ID, rabies, license, and microchip tags in a snap. Father-daughter duo Doug and Diane Danforth teamed up with veterinarians and DuPont to engineer Links-It®. Made with DuPont™ Kevlar® and a patented locking mechanism, Links-It® keeps tags securely on your pet’s collar. Links-It® also has a unique shape that makes it less prone to get caught on carpet, bedding, or other objects. Links-It® with Kevlar® pairs nicely with Pawdentify® Tags, which are easier to read and more durable than engraved metal tags. Both Tags and Connectors are made here in the U.S. from durable-but-lightweight polymers that won’t wear, rust, or make noise. Most pet parents go to great lengths to keep their furry family members safe. Yet, they often forego the first line of defense because, let’s face it, adding new pet tags or switching them from one collar to another can be downright difficult. This secure, vet-prescribed ID system was designed with the comfort of pets and people in mind. We developed Links-It® to be an easy, secure, and colorful way to attach ID tags to pets’ collars. All of us use Links-It® and Pawdentify® tags on the canines and felines in our families, and we are thrilled that The Grommet is making them available to you. Neat idea! I like that the tags are easy to read and will last. How does the sizing work? The Standard Tags are 1-1/4" in diameter and the Small tags are 1" diameter. It doesn't sound like a big difference, but the area on the Standard is about 60% greater than Small. We recommend Standard for dogs about 20 pounds and more. Our Beagles wear Standard. Small are designed for small dogs and cats. I bought 2 of these tags for my dogs.they both broke and i lost there id tags also. I am sorry to hear about your experience with the prior Links-It. Do you have any idea what happened to the connectors? In general, we know that dogs can do some crazy things, and we sometimes don't know what they did. If a tag gets stuck on something, we would rather Links-It break eventually than a pet be immobilized. That being said, we added Kevlar to Links-It to make it more durable and improve the experience of our customers. Hi Theresa, sorry to hear of your trouble. Was there a specific action that caused them to break? All these feedback details help out the Links-It folks. Theresa, I am sorry to hear of your experience with the prior Links-It version. On the Grommet, alone, we had almost 500 reviews on the prior version that average 4.1 of 5 Grommets. However, we have not been satisfied and have worked to improve. We are confident that adding Kevlar will improve durability. We also are providing what we believe are better instructions. In particular, if Links-It is not properly closed and locked, tags can fall off. When we started to include a "tip sheet" with orders, the problems we heard of declined a lot. Now, these instructions are on our new package. I don't know if this is what happened in your case. Again, I am sorry. I hope this additional information is helpful. 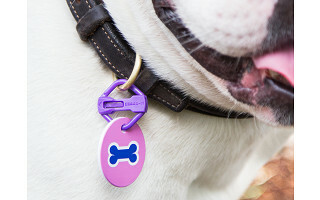 Pawdentify’s pet tag connector, Links-It® with Kevlar®, is a great upgrade from traditional metal rings and hooks. It lets you easily change tags and move them from collar to collar. Swap out pet ID, rabies, license, and microchip tags in a snap. Father-daughter duo Doug and Diane Danforth teamed up with veterinarians and DuPont to engineer Links-It®. Made with DuPont™ Kevlar® and a patented locking mechanism, Links-It® keeps tags securely on your pet’s collar. Links-It® also has a unique shape that makes it less prone to get caught on carpet, bedding, or other objects. Links-It® with Kevlar® pairs nicely with Pawdentify® Tags, which are easier to read and more durable than engraved metal tags. Both Tags and Connectors are made here in the U.S. from durable-but-lightweight polymers that won’t wear, rust, or make noise. Most pet parents go to great lengths to keep their furry family members safe. Yet, they often forego the first line of defense because, let’s face it, adding new pet tags or switching them from one collar to another can be downright difficult.